Heavy metal toxicity is a challenge many of us face every day, but we may not even know it. 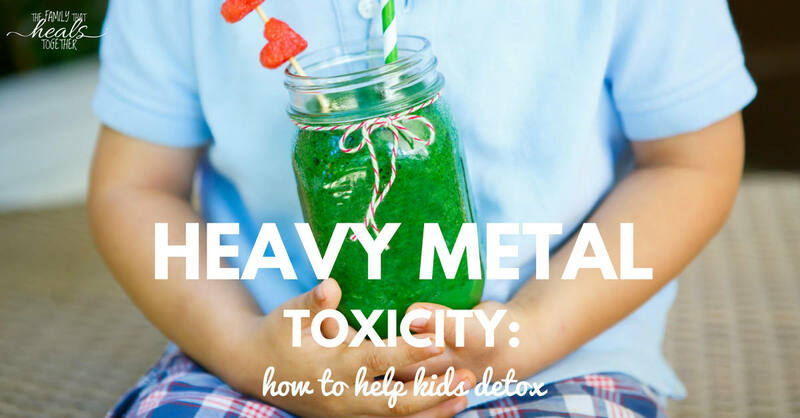 I’ve written about how to help your child detox on a regular basis, but here, contributor Danielle tells us about the ways children are routinely exposed to heavy metals and what to do about it. After the recent disaster in Flint, Michigan, you may be concerned about heavy metal toxicity, particularly lead, in our water. Though your water supply should be a concern, we should be concerned about the heavy metals lurking elsewhere and accumulating in our bodies as well. From the air to our water, and produce to vaccines, heavy metals abound, and cause destruction in our bodies if they are not properly detoxed. Heavy metals do not easily detox from the body, so it’s necessary to complete a detox regularly, or following a particular assault of heavy metals on the body, such as vaccines, to avoid heavy metal toxicity. How does heavy metal toxicity occur? Heavy metals are, unfortunately, found all around us. They’ve been found in our soil, in our water, on our produce, in the lead or copper pipes in our homes, and in pharmaceuticals. Some believe vaccines no longer contain mercury, but this is sadly not the truth. In the U.S., the flu shot may contain up to 50,000 ppb (parts per billion) of mercury. Two ppb of mercury is the EPA limit for drinking water. 200 ppb is considered the level at which a liquid is classified as hazardous waste by the EPA. There’s 250 times more mercury in just one flu shot. have unfiltered water through lead or copper pipes. In a child, heavy metal toxicity may show as delayed speech and focus, loss of facial asymmetry, loss of balance, muscle twitching, sudden allergies, eczema or asthma, digestive issues, sudden mood changes, and frequent runny noses and colds. Like any illness, heavy metal toxicity brings different symptoms to different individuals. The best way to know if you have heavy metal toxicity and need a detox is to complete a lab test. You can test heavy metal levels through hair follicle testing and blood testing. You can order hair follicle testing online, or request one from your current physician. Before beginning any detox, evaluate how well your child is currently processing toxins. Does your child sweat a lot? Good! Never sweat? They may have a backup which needs to be addressed. Does your child have bowel movements daily? If not, or there are other digestive issues; correct these first before beginning a detox. It’s a good idea to do a digestive tract cleanse before beginning a detox, so that your body will process out the toxins correctly. Otherwise, you may just be moving them around and overloading your liver, pancreas, and colon. Start from the bottom of the digestive tract (colon) to the top (stomach). Cleanse the colon by adding some raw, organic fruit and vegetable juice and fiber into the diet. Psyllium husks are a great fiber to use. If your child will allow it, enemas can be helpful for clearing blockages and cleansing the colon. You can also try Pooper, a new supplement from BIORAY Kids which helps kids keep their bowels moving. Get it here. Support the stomach by adding pre- and probiotics. Prebiotics, such as potato starch, are essentially the foods which feed the good bacteria. Feeding good bacteria ensures that they will thrive in your gut. These good bacteria will help ensure the toxins do not return to take up residence. Now, you’re ready to begin your heavy metal detox! Begin by detoxing through the skin, then building up the gut to prepare for ingested detox supplements. Baths: Epsom salts and essential oils will draw metals out of the body through the skin. You may also try bentonite clay in the bath. Try a lukewarm bath 3-4 days a week with 1/4 cup of Epsom salts and detoxifying essential oils, such as tea tree, peppermint, rosemary, grapefruit and lemon. Skin Brushing: purchase a skin brush and begin brushing your little one’s skin (always towards the heart) before each bath. This moves the blood and lymph fluids back to the center of the body to be processed and detoxed if necessary (Mom tip – I’ve actually lost weight since I started brushing, so get two). Sweating: get your child outside and work up a good sweat. If you are in a colder climate, you can also use a sauna at a local health spa or purchase a portable, home-use sauna like this. Clean up your diet: cut out processed grains, food dyes, and chemicals (read about the five ingredients you should remove from your diet NOW). Purchase organic produce, grassfed meats and dairy, and try a paleo or GAPS diet. Add a probiotic: purchase a quality probiotic and supplement it at high doses for at least two weeks prior to beginning the supplemental detoxes below. Jaclyn’s note: in my experience, you should build up to a higher dose of probiotics slowly in order to avoid too much die off. Get my favorite effective probiotic here. Now you are ready to start the movement of metals out through the digestive system. Monitor your child closely (yes, check out each bowel movement!). Chlorella supplements and tinctures: chlorella can be found in tablets, in powder, or as a tincture. I give my son 1 teaspoon of the tincture in two juices or water each day. Cilantro: juice it, chop it, or add it to food. Try to have your child consume two tablespoons of juice every 2 days, or consume a tablespoon of it raw every two days during your detox. If your child will not consume it as a juice or raw, try a tincture. Juicing: juice fresh, organic fruits and vegetables. Try to have your child consume one drink per day, at a minimum. Jaclyn’s note: add a raw egg yolk and homemade creme fraiche to turn it into a “GAPS shake” and to provide extra liver support. If this is your child’s first detox, complete this regimen for two weeks. If your child responds well, wait another two weeks and begin it again. This can be performed up to four times per year, ideally at the equinoxes. After a detox, be sure to keep giving your child organic fruit and vegetable juices to supplement vitamins and minerals and continue supporting the liver. 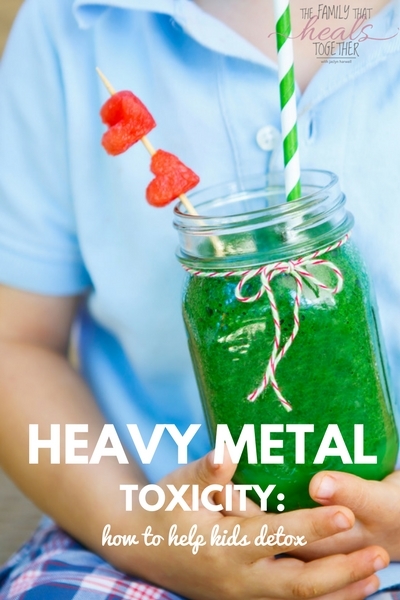 Have you detoxed your child from heavy metal toxicity? What worked for you? Wonderful post, thank you! Very safe and gentle plus lots of good (gentle) info on how metal toxicity happens 🙂 I’ll be sharing this! Hi Loren. I’m so sorry to hear this. I would suggest finding a functional medicine doctor near you who can help treat your son. Hi i too have a son in the spectrum of austism. A neurologist was most helpful. She told me everything about my child from a science perspective. But honestly nutrition has been the biggest factor! !He wasnt talking at all at first. He is now 7 yr s old and sooo much better. He reads well but we re still working on his communication skills. We went gluten free and dairy free and we have seen great results!!! But this diet i hope will seal the deal. Keep at it. Dont quit. I hope this post gets to you. I am not advertising anything, my twins have neurological issues, one was autistic. Read these two articles. One is about how aluminum gets to brain, and the other one is the Protocol of Dr Nemechek which help to bring down the inflammation and allows the brain to recover. Join a Facebook group called advanced TRS. My 15 yr old son has terrible trouble focusing, hardly ever sweats noticeably. What do you mean when you say ‘they may have a back-up that needs to be addressed’? How does one address it? Reading this post makes me think metal toxicity is his problem. We have been doing GAPS for 8 months now. His bowels may not be clearing enough, keeping him bogged down with toxins. Make sure he is using the bathroom at least once a day, and make sure he’s taking detox baths to encourage sweating. Read this: https://www.thefamilythathealstogether.com/want-help-child-focus-on-learning-try-giveaway/ You may find this supplement I talk about here can help with the focus issues. The same company also makes a supplement called “Pooper” that may help with “backup” issues. Thank you, for your help. thank you too for your new book.. I’ve been reading it all afternoon, and am quite excited! 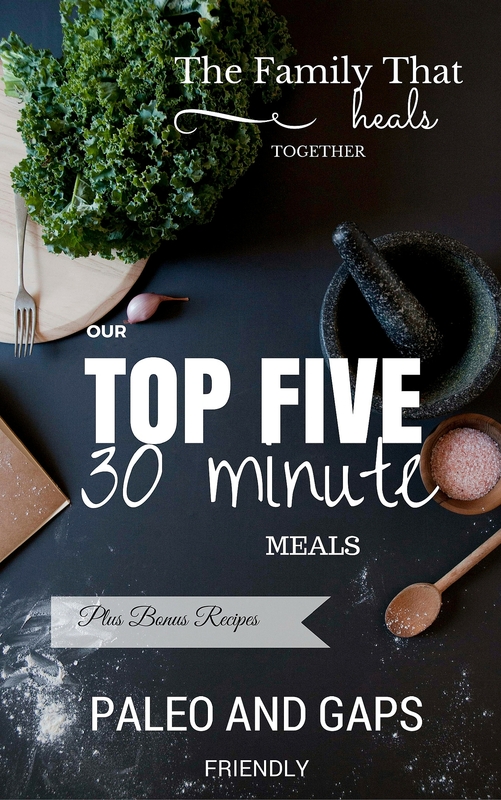 I can’t wait to try out some new recipes. I like creating my own, and we love toffee! I’m sure you, like me, need inspiration from others and get fed up with the same way of doing things! with several family parties coming up at the end of the year, You might just have saved the day. We love the Lord Jesus too! Awesome! I hope you love it and have a lovely holiday season! Hi Jaclyn-how did you give your son dandelion, milk thistle tea? Did you hide it in juice? Personally, I find it easier to give my son tinctures, actually. Does this also detox the brain or just the digestive tract? Well, the gut and brain are connected, so as you detox the gut, you can be sure it will benefit the brain! Was going to comment that epsom salts (mg sulfate), essential oils and many supplements can all be quite problematic and can actually add to the heavy metal load for people with MTHFR and CBS snp’s in particular. Then I saw your trackback article (haven’tread yet…but plan to) on MTHFR/vaccines. Simple sea salt, baking soda (small amount) or bentonite clay would be better choices for these folks for detoxing assistance. Genetics changes the ballgame on so many things and is so individual! How do I know if my child would have this issue? The items above have chelating properties. Important to keep bowels moving too as you are removing the metals. Hope this helps and I wish you and your children optimum health.